Bullock's Point got its name from Richard Bullock, who established a farm on the neck of land in 1666. The point, which juts southward toward the mouth of the Providence River, was surrounded by shoals that proved treacherous for the growing shipping traffic heading to and from Providence in the nineteenth century. An unlighted day beacon was placed offshore from the point in the mid-1800s. After a Congressional appropriation of $1000 in 1872, a small lighted beacon was placed on a granite pier. The fixed red light, shown from a sixth-order Fresnel lens, went into service on November 4, 1872. At first, the duty of looking after the small aid went to Joseph Bowes, the keeper at Sabin Point Light to the north. It was soon deemed necessary to have a keeper living full time at Bullock's Point Light. An additional appropriation of $15,000 was obtained on June 23, 1874, for the building of a new combined lighthouse and dwelling. The work began in August 1875. First, the original pier was enlarged. The construction of the lighthouse building soon commenced but was delayed by bad weather and ice on the river during the winter months. The station was finished in the early spring of 1876. This was an unusual lighthouse unlike any other in New England. It was an attractive Victorian dwelling sitting on a rectangular granite pier, with a lantern on its roof. A sixth-order Fresnel lens exhibited a fixed red light, and a fog bell was added in 1907. Right: John Anderson was keeper at Bullock's Point Light in 1909-1910. He is seen here with his wife, Hannah, and their dog, Snooks. The photo was taken about 1917 while Anderson was keeper at Princess Bay Lighthouse on Staten Island, NY. Photo courtesy of Judy Carpenter. 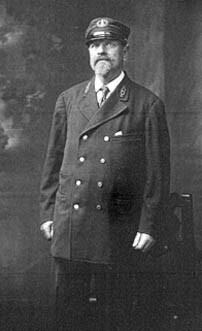 Joseph P. Eddy was keeper from 1886 to 1892. His four children rowed to shore to attend school in the Drownville section of Barrington every day. The family endured a brutally cold winter in 1892, when even a steamer bound for New York City became lodged in the ice. Capt. William Thomas Tengren, who was born in Sweden, was keeper from 1901 to 1909 and again from 1918 to 1926. Tengren had gone to work on ships at the age of nine. As he later explained, nobody ever bothered to check his age. During his time on ships, Tengren learned about all things nautical from the older sailors, and also how to read and write. His travels eventually landed him in the United States. 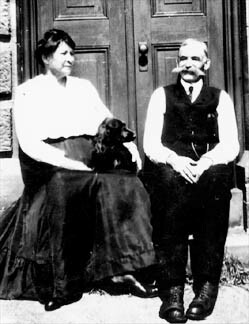 Captain Tengren lived at the six-room lighthouse with his wife, Charlotta, and their three children, Anton, Agnes, and Mary. The Tengrens added a deck to the lighthouse to serve as a "yard" so that the children could play outside. Left: Captain William Thomas Tengren, photo courtesy of Jessica Blackwelder and the family of the late Thomas W. Tengren. The Tengrens also had plenty of visitors, usually fishermen and their families who would dock at the lighthouse and spend the day. The Tengrens recorded that in the winter of 1918­19 the river froze over and it was possible to walk to shore. Mary, daughter of Keeper William and Charlotta Tengren (left) and Charlotta, wife of Keeper Tengren, rowing out to the lighthouse. Courtesy of Jessica Blackwelder and the family of the late Thomas W. Tengren. Florence and Anton Tengren (son of Keeper William Tengren) on the deck outside the lighthouse with their son, Thomas, photo courtesy of Jessica Blackwelder and the family of the late Thomas W. Tengren. Anton Tengren's son, Thomas William Tengren, spent some time at the lighthouse with his grandparents when Anton was overseas during World War I. Years later Thomas would say, "You ain't been cold till you've sat in that outhouse in January with a good stiff breeze coming in off the bay." Courtesy of Jessica Blackwelder and the family of the late Thomas W. Tengren. The outhouse, of course, hung over the river outside the lighthouse. Living at the lighthouse was hard work for everyone in the family. Supplies were bought a month in advance in case of bad weather. The Tengrens rowed to and from the lighthouse for school, church and medical attention. Rainwater was boiled for drinking. There was no elecricity at the station; the light was fueled by kerosene. The next keeper at Bullocks Point was Andrew Zuius. He and the Tengrens became friends and the Tengrens sometimes returned to spend time at their old home. Once, during a cold winter in the 1930s when the river froze over, Keeper Zuius's daughter, Elizabeth Winterbottom, was pulling her son, Warren Winterbottom, across the ice on a sled. Elizabeth fell through the ice but was helped to safety by other family members, and she apparently fully recovered from her brief dip in the frigid water. On May 27, 1930, a sailboat was capsized in a squall near Bullock's Point, and Keeper Zuius rescued the two persons on board. The hurricane of September 21, 1938, the greatest storm of the twentieth century in southern New England, undermined the pier beneath the lighthouse and did great damage to the building itself. Keeper Zuius survived, somehow keeping the light burning through the storm. In the morning he found that the wall facing the wind had been ripped away and the stairs had been washed out, and all his belongings were swept away. Bullock's Point Light was discontinued shortly after the great storm and the structure was torn down a few years later. Today a small lighted beacon on the old foundation marks the spot where families once worked and played. Left: Keeper Zuius can be seen on the first floor of the lighthouse in the aftermath of the Hurricane of 1938. Thanks to Seamond Ponsart Roberts for the photo. An automated light on a skeleton tower now stands on the base of the old lighthouse. Special thanks to Jessica Blackwelder and her family for their assistance with this history.